Jiaogulan Tea may promote Cardiovascular Health, Healthy Digestion, Strength, Endurance and Immunity. It is in a rare class of herbs known as 'Adaptogens', which help the body to self-regulate without causing any harm or imbalance. Jiaogulan Tea may be especially helpful in building your body's natural resistance to stress. The amazing effect Jiaogulan Tea has on Cardiovascular Health has earned it the title of "The Herbal Heart Defender". Jiaogulan Tea may have a direct strengthening effect on the heart, possibly causing the heart to beat more powerfully. It may also have a host of secondary cardiovascular benefits, such as promoting healthy blood pressure. Jiaogulan Tea has been shown in laboratory studies to dilate blood vessels. 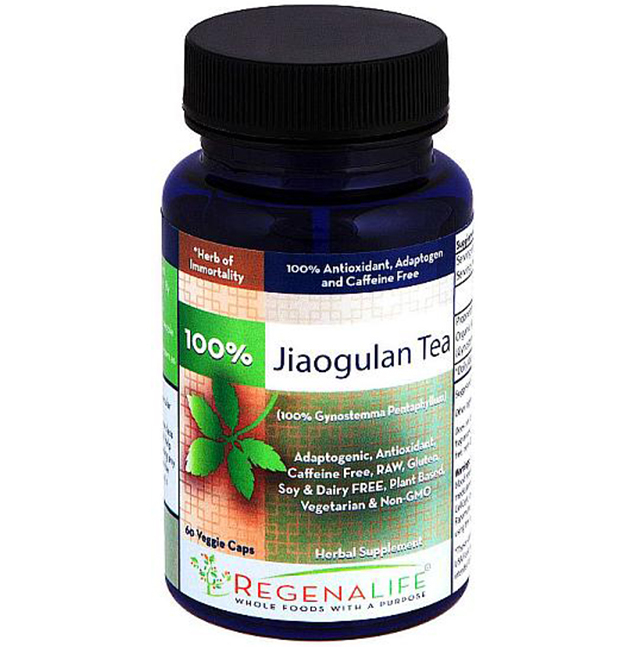 Jiaogulan has been in use in Asia for centuries as a refreshing and health promoting herbal tea. Jiaogulan assists the body to achieve homeostasis (constant internal balance). Drinking Jiaogulan Tea can naturally assist you in controlling and maintaining healthy blood pressure. 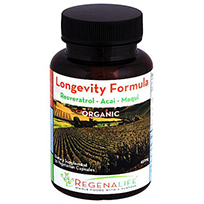 For hundreds of years, Jiaogulan (pronounced jee-OW-goo-lan) has been valued as "The Herb of Immortality," in regions where the highest concentration of centenarians (people living over hundred years) are known to live. 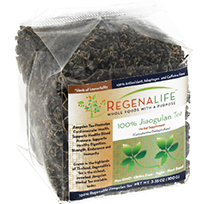 RegenaLife's Jiaogulan Tea is grown according to Thailand's rigorous certification standards, ensuring no harmful synthetic chemicals or pesticides are used during the growing, harvesting, storing and shipping process. Jiaogulan is a delicate herb. Heat the water until steaming, when small bubbles begin to form. Do not boil. Steep the tea for 2-3 minutes until a light golden color, or longer if you desire a more potent infusion. Jiaogulan Tea may also be prepared as a refreshing iced beverage! It is naturally sweet and requires no additional sweetener. Studies on Gynostemma have found that the plant is effective in regulating blood pressure, strengthening the immune system, healthy cholesterol, and in increasing stamina and endurance properties. Gynostemma has also been found to have hyperlipidemic, lipid peroxidation, adaptogenic, cardio- and cerebrovascular effects. Does Jiaogulan interact with certain medications? In studies, Jiaogulan has been shown to increase the time blood needs to clot. When taken with antiplatelet or anticoagulant drugs, the effect of the drug may be increased, resulting in uncontrolled bleeding. Jiaogulan may also interfere with drugs used to suppress the immune system due to the herb's strengthening effect. 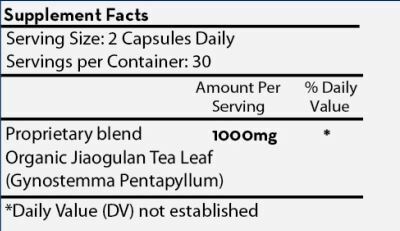 Those taking such medications should consult a physician prior to consuming Jiaogulan. Jiaogulan (Gynostemma Pentaphyllum) tea leaves. Free of wheat, processed sugars, syrup, gluten, corn, salt, hydrogenated oils, soy, rice, barley, dairy, egg, yeast, caffeine, crustacean shellfish, synthetic sweeteners, artificial color, fragrance, preservatives, monosodium glutamate (MSG), and genetically modified organisms (GMO's). This product is not irradiated. I've been drinking two cups of Jiaogulan tea a day. The taste is great! The amount of tea for the price is amazing!" - Damon L.
I'm a huge fan of the Jiaogulan tea. I drink it hot and cold. I enjoy bitter tea, so I steep this tea for an extra 20 or 30 minutes. After I use the leaves to make a pot of tea, I mix them up in my fruit smoothie. This product is a must have for any tea drinker. I give it 5 of 5 stars. - Chuck H.
I absolutely love the tea! Honestly I didn't think I would. I didn't have a tea maker for one, and it just looked funny. But after reading about the many benefits and I'm so glad I did. Its absolutely delicious. Tastes like a strong green tea. It helps me to get my water intake in and less sodas or other flavored drinks . I feel a sense of balance drinking it as well. I sip it throughout the day and since it has no caffeine I don't have to worry about it keeping me up all night. - Angie D.